Now, exporting nations are feeling the hit as the China-fueled boom slows. Topping the list are big commodity players Australia and Brazil, but also smaller resource-rich countries, such as Guinea, Indonesia and Mongolia, where minerals make up a disproportionate share of the economy and employment. In countries specializing in crucial commodities, such as iron ore and coal, sluggish demand and falling commodity prices are reducing government tax revenue, increasing trade deficits and affecting currency values. The Australian dollar reached a four-year low in November against the U.S. dollar due in part to sliding raw-material prices and slowing Chinese demand growth for those commodities. J.P. Morgan this month cut its forecast for 2015 Australian economic growth to 2.8% from 3.3%, and Brazil recently halved its own growth forecast for 2014 to 0.9% from 1.8%. Mining profits as a share of the economy in both countries more than doubled during the past 15 years, according to the World Bank. The longer-term impact of a collapse in commodity prices could be even more profound, hurting the economies of producing countries and boosting buying power in Western consumer economies. “The impact of oversupply could be a mess,” says Lourenco Goncalves, CEO of Cliffs Natural Resources Inc., a midsize miner that laid off workers in Australia. Meanwhile, the biggest mining companies say they are still committed to plans to keep topping production records. Rio Tinto PLC and BHP Billiton Ltd. have been shipping cargoes from Australia’s remote northwest at record rates. For smaller countries, the growing dependence on mining is even more apparent. In Guinea, the share of mining profits as a percentage of GDP more than tripled to 18.3% between 2000 and 2012, the latest data available, according to the World Bank. And in Mongolia, it nearly doubled to 11.9%. At this point, no country can absorb China’s slack, although executives at mining companies, such as BHP Billiton, still hope India may help absorb new production. Still, China is expected to set the tone for the next decade. No commodity has been as China-dependent as iron ore, and for good reason: China makes half of the world’s steel, and 98% of iron ore goes into steel production. 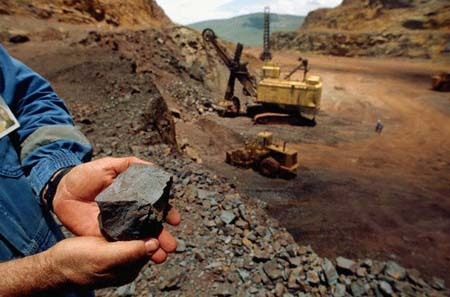 China imports two-thirds of the 1.2 billion tons of iron ore traded annually on seaborne markets. Far more countries have come to feed at the China trough: In 2003, eight nations exported more than 10 million tons of iron ore. Last year, nearly twice as many–15 countries–did so. Australia, the world’s top iron-ore exporter, sends 80% of its iron ore–worth $67 billion last year–to China, and Brazil sends half its production of the mineral there. In recent years, mining companies in those countries have ramped up production, employment and investment in railroads and ports anticipating that China’s steel industry would increase production and need more iron ore. Instead, during the first eight months of the year, Chinese steel consumption fell 0.3% to 500 million tons–the first such decline in 14 years. “The country is settling into a slower steel consumption pattern, more typical of modern, developed Western economies,” says Daniel Rohr, an analyst at Morningstar Inc.